And each year I've been trying to read a little more. This year my goal was 68 books, one more than I read last year. I've read 72 books this year. I might be able to squeeze in one more that I'm working on to make 73. I've made a habit of sharing my favorites each year here on this blog, so the tradition continues. In the past, I've been really disappointed in some of what I've read, so I did a little more homework in scouting out books that had been highly regarded this year. I figured if the year was going to start out right, it needed to start with some great reads that inspired me to read more. I rated 6 books with 5 stars this year...and here they are! Sharon Draper's Out of My Mind- This book is simply incredible, perhaps I'm affected more by this story as a teacher, but my dad found me crying on the couch as I read this book over the summer. A young girl, battling cerebral palsy, discovers the joy of communication after a lifetime of keeping her thoughts to herself. Graeme Simsion's The Rosie Project- A man with Asperger's Syndrome is on the hunt for a wife. Hysterically neurotic. I loved it. The Art Forger by B.A. Shapiro- Maybe I love this book because I'm obsessed with Neal Caffrey and White Collar, a show on the USA Network (I can't believe this show just ended!!!! ), but there's something about the ability to forge the artwork of renowned artists and pass it off as the real thing. This story had me hooked. One Plus One by Jojo Moyes- Moyes has been writing and publishing novels for years, but her real explosion on to the scene happened with Me Before You in 2012. Her recent novels are getting pretty big press and I can see why. Easy to read chick lit that grabs you and entices you to want more each time you read. If you haven't picked up a Moyes novel yet, you most definitely should! I haven't gotten to The Girl You Left Behind yet, but it's on my list for 2015! Rainbow Rowell's Eleanor & Park- This is probably my favorite book of the year and I've been reading everything by Rowell that I can get my hands on in recent months. Eleanor & Park is the sweetest young adult love story. Run to the nearest store and get your hands on a copy. The Storyteller by Jodi Picoult- I had read a book of Picoult's in the past and didn't care for it, so I'd always avoided her books. But in my search for highly rated books, I came across this. It was, hands down, amazing. Now I'm having to rethink my ban on Picoult and add a few more of her books to my 'want to read' list. And, one honorable mention to hand out...I didn't give this book 5 stars, but it has lingered in my mind the entire year. It was the first book I read in 2014. I despised it initially, hence the rating of only 4 stars, but by the end it was one of my favorites. 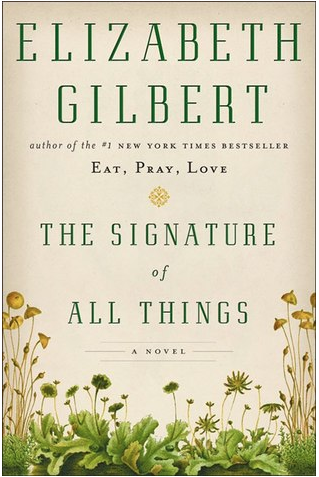 The Signature of All Things by Elizabeth Gilbert- This was a selection for our book club in January and it was well received by our group. You'll learn more than you ever wanted to know about moss and many other plant species (the research for this book must have been soooooo boring) but the main character, Alma, will find a place deep in your heart. Need a good book for 2015? I hope you'll choose one of my favorites! 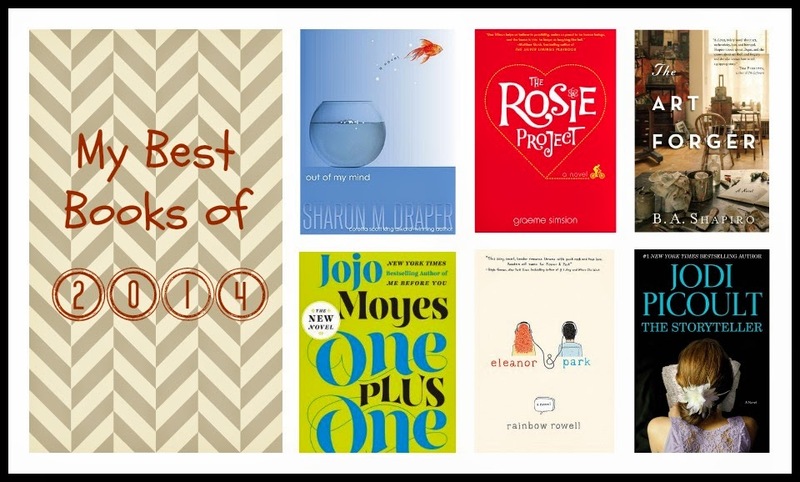 You can also check out the Goodreads recent winners for 2014 as a good place to start! Have a recommendation for me? Leave it in the comments! I'd love to hear your ideas! Wishing each of you a very happy and healthy 2015! oooh the storyteller is on my list for a challenge i'm doing next month, so i can't wait! one plus one is on the list as well, and i loved the rosie project! They are all great books! Enjoy! I loved Out of My Mind! I read it with my kids in the spring. They were in third grade and first grade at the time. It reminded me so much of a patient of mine. I have worked with him as his PT since he was five months old, and he recently turned ten years old. His mother has since read the book with him, and he said he often feels like the young girl in the book. Unfortunately, he has several medical diagnoses, including CP and cortical visual impairment (CVI). He is unable to read the book himself due to his diagnosis of CVI, but he has an amazing mind and great comprehension. Another wonderful book (with a similar theme) is Wonder by R.J. Palacio (if you haven't read that one). Thanks for the other suggestions! I have read Wonder also! It was a great book too! Hope you enjoy some of the others! Congratulations on achieving your reading goal! You really do read a lot. I've missed having easy access to a library with lots of great English books, especially young adult fiction. At home I was a teacher librarian, thus my love of YA novels, like Wonder and Stolen. I agree with quite a few of your reads, especially, The Rosie Project and the YA title, Eleanor & Park. I read both of them last year and thought they were both really clever, innovative stories. My best reads this year were both from the Booker Prize long list, the winner - A long road to the deep north, which is harrowing but really a wonderful WWII story, and the most unusual, We are completely beside ourselves, such an interesting novel about sibling relationships and how they shape the individual. Thanks for your review of "The art forger", it sounds fascinating. I'm adding it to my "to read list". Happy holiday reading and best wishes for a great new year. I'm glad that everyone is enjoying book club! I like that it encourages us to read things that we normally wouldn't select for ourselves!